Submission of ONLINE applications starts from Dt:09.08.2018. Last date for submission of ONLINE applications Dt: 08.09.2018. All the question papers (Paper-I, II & III) except Languages will be supplied in English version only (Paper-I & II are common for all subjects). 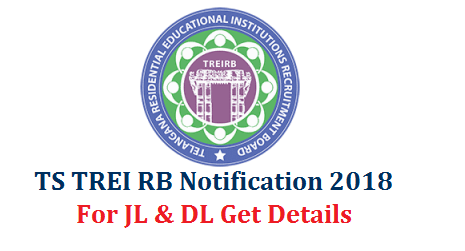 Applications are invited Online from qualified candidates through the proforma Application to be made available on Board’s WEBSITE (www.treirb.telangana.gov.in) to the post of Degree College Lecturers in Residential Educational Institutions Societies. Submission of ONLINE applications starts from Dt:14.08.2018. Last date for submission of ONLINE applications Dt: 13.09.2018. All the question papers (Paper-I & II) except Languages will be supplied in English version only (Paper-I is common for all subjects). Paper-I and II are Objective type. The Board reserves the right to conduct the Examinations in OFFLINE OMR mode. STEP: The Candidate has to visit the WEBSITE www.treirb.telangana.gov.in and apply online, candidates have to ensure that there are no mistakes in it. The Board bears no responsibility for the mistakes, if any, made by the candidates. STEP:- After entering the details in the Portal, the applicant will proceed to payment gateway. STEP:-The applicant should pay the prescribed fee as specified through any of the three modes viz. Debit Card, Credit Card and Net Banking. Separate instructions have to be followed for each mode of payment. STEP:-After payment of fee and after filling the entire application form, the PDF Application will be generated which contains the particulars furnished by the candidates. The ID No in the PDF Application form has to be quoted for future reference/correspondence.